People who use Tinder these days often do it in pursuit of sheer entertainment rather than a sincere effort to find actual dates -- so it only made sense for a group of my friends to take that dynamic to its logical conclusion and turn it into a game: Tinder bingo. Don't worry, you and your friends can play, too. It was one of one of those rare, glorious summers when the weather was perfect and all of us were single. Unhindered and unattached, my girlfriends and I basked in the glow of the summer sun and the magic of our collective singledom. In short, we were having a damn good time. Standing outside a bar in our little huddle one night, we listened to an acquaintance gush over the then-latest dating app that had connected her with Mr. Back Muscles, a man who had just ducked inside. Her endorsement was convincing. So with an air of why-the-hell-not, we all decided to download Tinder. Much has been written about the "Tinder effect" in big cities around the world. And there's no denying the heady giddiness that comes from having a meat market of men at your fingertips. But rural digital connections are different. Given our town’s tiny population, my girlfriends and I weren't surprised to see familiar faces on our screens as we began to swipe: exes, friends, co-workers. It’s hard to keep a low profile in a small town. Soon, a heady cocktail of curiosity, voyeurism, and irony propelled us. The four of us 30-something gals had fully gone down the Tinder rabbit hole. We were discovering all kinds of strange, undateable men -- but there were definitely some strong matches also beginning to take hold. For a second, it seemed as if what had started as a half-hearted joke over cocktails might result in a few actual dates. But does Tinder ever really lead to actual dates? As screenshots made the rounds, we realized that some of us were sharing matches -- and that a few of those common prospects, like Jon and Kyle (names changed to protect the guilty), were using the same pick-up lines on more than one of us. The pool, as always, was just too small. At this realization, all bets were off. The pursuit now felt more like a game than an attempt at finding real connections. So, we decided to take that game all the way. The result? Tinder bingo. In short, the Tinder version of bingo plays quite a bit like regular bingo. If you need a refresher on that, ask your grandparents. Any message containing the word "sup"
Of course, categories for Tinder bingo will obviously need to be adjusted if you're swiping in Manhattan or Malibu, allowing for man-bun hairdos, city cycling, requisite gym photos... make it as local as you like! 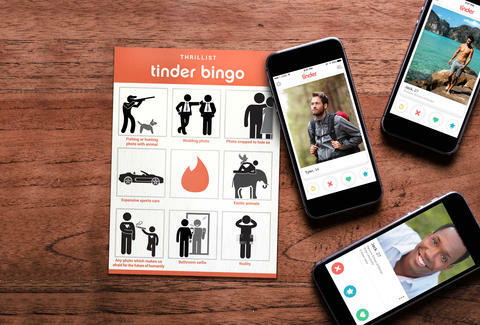 Wherever you are, if you and your friends ever find yourselves trapped in the dating-app jungle, a round of your own version of Tinder bingo might be just what you need to find your way out of the woods. Tinder bingo never got old. We broke it out while tailgating at a rodeo with boxed wine, in each other's rooms while getting ready to go out, anytime we had a few minutes to kill with some mindless entertainment. Most challenging was trying to differentiate one man's profile from another in the sea of antler pics and lift kits flashing across our phone screens. So, if you're managing to find a string of successful and satisfying dates on Tinder, well done. 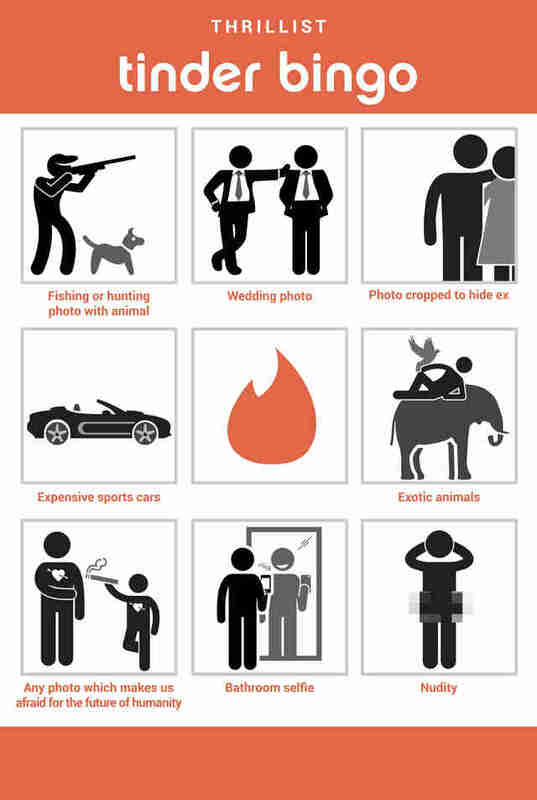 But if you're finding it to be something of a joke, and have some friends who similarly enjoy a good joke, Tinder bingo might just be for you. Want to get your own game going? Download a printable card here. Sign up here for our daily Thrillist email, and get your fix of the best in food/drink/fun. Liz Talago is a freelance writer, editor, and #creativeforhire who swipes right for motorcycles and travel pics. Follow her exploits on Instagram: @miss.betty.p.